"Yallarhammer - Old Flies - Fly Angler's OnLine Volumn 6 week 8"
The exact origin and birth date of the Yallarhammer pattern has apparently been lost in the mists of pre-recorded North American history. Unfortunately, American Indians did not have written languages and passed their histories and customs down as oral histories. It is generally accepted that it was the Cherokees who first brought down a Yellow-shafted Flicker with a blowgun, wrapped its bright quill around a hook, and caught a trout. Maybe they first tied the fly as they tied the deer hair fly, reverse Palmer style. However, the Cherokee as an invader of the Southeastern United States may have simply adapted what those they drove out already were doing. Nevertheless, whatever the particulars it is clear that the Yallarhammer fly pattern pre-dated European settlement of America. "The two specimen flies which I enclose you will see are reversed hackles, made by cutting narrow strips of deerskin with the hair left on, wrapped around the hook a few times, and well tied at each end. The North Carolina Indians (Cherokee) tie them to perfection, using some sort of cement or waterproof varnish over the thread, and for the bodies the various colors and length of hair from different skins, but usually rather stiff hair, preferring it from the deer's legs. They often cut the hair off and use it without the skin, but made in this way the flies are not as durable. They use feathers occasionally in the same way." The original Yallarhammer is tied from the leading edge of the primary flight feather of the Yellow Shafted Flicker (Yallarhammer), an endangered species of woodpecker. It is illegal to possess this feather, so the primary flight feather of a dove or quail wing, dyed golden yellow is used as a substitute when tying this pattern. To use this feather for tying the fly you must first soak the wing feather in warm water, to soften the quill. Then the softened quill is split length-wise and any pulp within the center of the quill is cleaned out by scraping. Tie the prepared quill in at the rear end of the hook shank so that the top few barbs extend beyond the hook, forming a tail. Then wrap the split quill forward to the eye of the hook, in touching turns, and tie off. 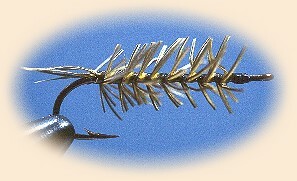 Trim the feather fibers to suitable length, slightly shorter than the hook gape distance. The resulting "bottle brush" is a Yallarhammer. The fly became popular in the 1930's and 1940's tied on a trailer hook (ring eye, long shank) and trailed behind a gold willow-leaf spinner blade, which probably accounted for most of its fish-catching success. In the 1960's, it was the inspiration for two new Yallarhammer patterns. These are the Yallarhammer nymph and the Yallarhammer dry fly. However, these patterns are another story for another time. The original Yallarhammer pattern is generally believed not to imitate anything in nature; it's an attractor pattern. However, the streams where it was born do have an abundance of large yellow stonefly nymphs having a general length of about 1 to 2 inches and a generally yellow body color, so it is possible that the original Yallarhammer pattern was an imitation of the large yellow stonefly nymph. Hook: Mustad 9674 (size 6 C 12). Tail: First few fibers from split dove primary flight feather. Body: Split dove primary flight feather wrapped palmer style.